Father Benedict, as he would have preferred to have been called instead of Pope emeritus Benedict XVI, celebrates his 88th birthday today. It’s going to be a private affair, as usual, with his brother, Msgr. Georg Ratzinger, visiting. The retired Pope is doing well, according to his private secretary, Archbishop Georg Gänswein, in recent interviews: his mind as sharp as ever, although his legs have begun to give him trouble. Indoors he walks with a cane, outdoors with a walker. But at the age of 88, mortality is a topic that Father Benedict does not avoid. He has spoken about his own death several times with Msgr. 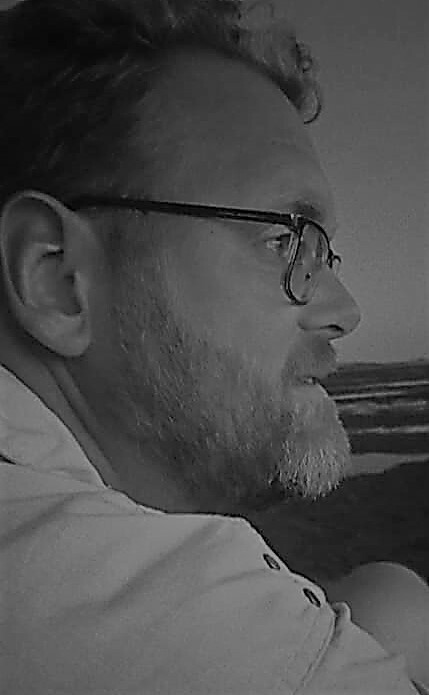 Gänswein. For now, however, we wish Benedict a happy birthday and all the blessings of the Lord for the future. May he live long in comfort, surrounded by those he loves, and aware of our gratitude for his prayer for us. In all likelihood we’ll see a new archbishop of Berlin appointed this year, and the Archdiocese is certainly doing what they can to speed up the process. 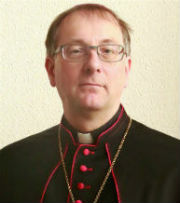 On a special website it is asking everyone, faithful or not, to say who they think should be the successor to Cardinal Woelki, who was appointed to Cologne in July. From the numerous suggestions, which also include the names of Lutheran Bishop Margot Käßmann and former Berlin mayor Klaus Wowereit, some trends become visible. In addition the those who simply want Cardinal Woelki back, there are some Berlin clergy who appear frequently among the suggestions. 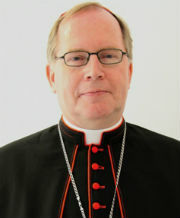 Top of the list is Bishop Matthias Heinrich, auxiliary bishop of Berlin since 2009. Apostolic Administrator Tobias Przytarski (pictured at right) and Episcopal Vicar Stefan Dybowski are also named. Other names from outside Berlin are those of Bishop Gerhard Feige of Magdeburg, Cardinal Reinhard Marx of Munich and Father Klaus Mertes, S.J., the school director who uncovered the sexual abuse scandal at Berlin’s Canisius College. Another familiar name, mentioned often in connection with that of Cardinal Marx, is that of Archbishop Georg Gänswein (pictured at left). The personal secretary of Pope emeritus Benedict XVI and the Prefect of the Papal Household is suggested as archbishop in Berlin or, if Cardinal Marx goes to the German capital, of Munich. 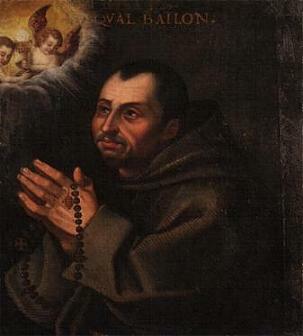 Not all the names suggested are likely to be among the list presented to the Congregation for Bishops or the Berlin cathedral chapter, but they do indicate that the Catholics of Berlin want someone worthy of succeeding Cardinal Woelki, who certainly made an impression in his three short years as their archbishop. The influence of the website and the suggestion posted on it will be minimal, as the concordat that covers the process of election of new archbishops in Berlin is pretty strictly regulated. The cathedral chapter of Berlin, the Apostolic Nuncio and the bishops of the dioceses that include territory of the former country of Prussia (which is the majority of German dioceses) can all nominate candidates. At most, the names suggested will inspire them or remind them of candidates they did not think of themselves. The suggestions will not, in any way, be used in a democratic way.